Sergeant E5 Robert Lamarr Bryan was born on October 18, 1949 to Riley and Vera Arlene Bryan. He had two older brothers Larry and Roger, an older sister Ginger and a twin sister Rebecca. When Robert was four weeks old, his parents took the twins to northern Michigan deer hunting for two weeks because they were too young to be left behind. Perhaps this partially explains why Robert grew up adventurous and loving the outdoors. Robert's parents lived on a farm near Colon, which is a small community of 1,000 people in southwestern Michigan. When each child reached a certain age, they got volunteered to milk the cows and help bale hay. Many a hot summer day ended down at their favorite swimming hole. The family went on numerous camping and fishing trips to northern Michigan and Minnesota. Robert was fortunate to have his Grandma living just next door and she would be the first person packed and ready to go on these family vacations. Robert was a happy, fun loving person and developed a great sense of humor. He attended Colon Community Schools. If you were a blonde, you stood a much better chance of getting a date with Robert. He graduated from Colon High School in 1967 winning the Most Valuable Player trophy for the varsity baseball team. Like his father he was a talented baseball player. Robert met his military obligations head on by enlisting in the Army in January I 968. The family appreciated his bravery in such perilous times. Robert came home for a visit after completing his first tour of combat in Vietnam and informed the family he planned to return for a second tour. Family members couldn't understand why he would volunteer for another tour, but he said, "They need me" He certainly was a man of dreams, passion, strength and loyalty. The four enemy personnel aboard the sampans were eliminated. Later, while sweeping the contact area, the team again received intense fire from an enemy soldier concealed in the nipe palm within ten meters of the ranger team. Reacting instantly to the critical danger, Sergeant Bryan charged forward and eliminated the insurgent at point blank range with rifle fire. Sergeant Bryan's actions were in keeping with the highest traditions of the military service and reflect great credit upon himself, his unit and the United States Army. On 11 June 1970 Sergeant Bryan was again to be honored with a second Silver Star for Gallantry. in action. The details of this action are as follows: Sergeant Bryan distinguished himself by heroism in connection with ground operations against a hostile force while serving as a Team Leader with Co E (Ranger) 75th Inf3/9th Inf Div in RVN. While his element was proceeding along a river bank, Sergeant Bryan observed an enemy soldier to his front. The enemy attempted to react, but Sgt Bryan immediately eliminated him. As the team moved further along, Sgt Bryan observed two more enemy soldiers on the opposite shore. Without regard for his personal safety, he immediately moved to an exposed position and eliminated one while another team member fatally wounded the other. Shortly thereafter, the team encountered three more enemy soldiers about fifteen meters to their front. Sgt Bryan and other team members immediately rushed the enemy, eliminating them before they could fire back. When a bobby trap detonated, causing several members of the team to receive fragmentation wounds, Sergeant Bryan, without hesitation, applied first aid, then directed a helicopter to pick up the wounded. Sergeant Bryan's actions were in keeping with the highest traditions of the military service and reflect great credit upon himself, his unit and the United States Army. Sergeant Bryan continued to lead his Ranger Team 1-7 in the warrior tradition, leading by example, encouraging and inspiring his fellow rangers to give 100% and then some. His dedication to his fellow Rangers, duty and mission directly contributed to the high rate of efficiency and success of the Ranger Operations conducted against enemy forces by Echo Rangers. 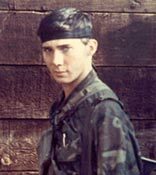 On 13 July 1970, just 24 days away from Robert's departure from Vietnam, he was killed in action by enemy ground fire, while conducting a visual reconnaissance from a light observation helicopter preparing for yet another mission.